I do no need this feature, but I read many requests for it from other people. So I have created a voteable topic for it. The request is to add a possibility to apply a watermark during export, so that no additional software is needed to watermark photos before they can be published. I can definitely understand why this might be an important feature to many people, but like you, I have no personal need for it. It is not urgent but yes, it would be nice one day. great idea. I’m using Irfan View for several years, but never ever thought, that watermarks can be added within this great program (and still searching for a watermark-program, too…until now). Rotation is missing. I had to do it in my watermark file. The thing is, to add a watermark on a jpg we will lose quality, aren’t we ? I guess it is better to work on TIFF only and convert after. So the best quality/less work solution is really when it is integrated to Photolab ? I will be happy if I can add a logo to PhotoLab. That would make me more effective. It would be good if you could use image files that support transparency. Definately a watermark feature for me. Make it so you can slide it around the image so you can choose to set it in a location where it would be almost impossible to clone out or on a plain section to maintain visibility of your work. Also use the export box to toggle the watermark on/off and give the choice of exporting both versions. I use Zoner ZPS-X to add a copyright to my DXO PhotoLab JPEG exports the addition is handled as a layer and does not (as far as I know) degrade the image quality. What ZPS-X does do is write itself into the metadata as the development software which I don’t really like. I might just give Irfan View a look. For me this is the only missing function to replace Lightroom completely. You are easily pleased. While I no longer use Lightroom, there are a number of Lightroom features I would love to see implemented in Photolab, and watermarks would probably be at the very bottom of that list. But, like you, in general, I am very satisfied with Photolab. 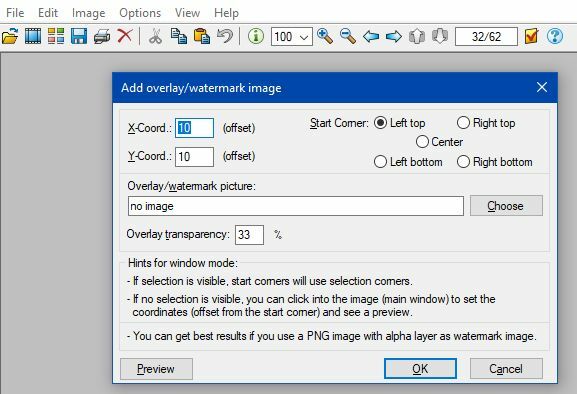 Watermarks as many have noted are easily added in every resizing program. My own workflow is to create masters (usually in jpeg 12 format for size reasons unless I plan to do further pixel editing) and resize those for various online platforms with dedicated resizing software, adding additional data or watermarks at that stage. Dedicated resizing software is much faster than resaving in PhotoLab. I’d hate to see DxO fiddling around with a mediocre watermarking feature which is done better and faster by $15 or even free utilities. In my opinion, for DxO are more important topics to do’s . Nice to have? Yes, but in fact first of all DxO should follow the core competence of developing. The time to develop and watermarks are no longer in fashion ! Concur that this would be a very helpful feature to minimize the need to edit in yet another program. Gets my vote. I use Zoner PhotoStudio too, since 4 yaers or so. It’s great as an Editor program, complete with DAM feature. Very easy to add a watermark or logo on any place one wants. As far as I can say, it doesn’t degrade the image quality, but the watermark cannot be deleted afterwards. But personally, I think that such a feature is not needed in PhotoLab. I would use it in every export these days. There are some edits I still have to do in LR. Adding IRFANVIEW for this feature would be another disincentive to staying with PL. Although I am not (yet) adding watermarks I use FSResizer for resizing images. It is very comprehensive with many options as to how you resize depending on the end point (print, web etc). It also has the option of adding a watermark. It is fast, portable (so no install required) and free. As there are so many options for adding watermarks (as noted above) I think the programmers at DxO are better spending their time working on core features to do with image processing rather than ‘nice to have but not vital’ additions. I notice that a significant number of Photolab users believe that the provision of a watermarking function will devote valuable resources to developers. However, there is one detail: The code that is needed to a large extent exists in a PhotoLab. It is activated when the trial period expires and marks the exported photos with the “DXO PhotoLab DEMO”. That’s why I think that this is a matter of desire by DXO. I do not want to justify my desire to use watermarks. I taking this dispute for more than 10 years on photographic forums. The question for me is very, really very simple: Who wants my money? A primitive watermark function is no problem. The issue is that as soon as DxO or any other developer add a watermark function, there are another thirty or forty feature request on how it looks, can it be a png, can a logo png be combined with text, positioning, alternate transparency. DxO is not an efficient tool for resizing for web (where watermarks are necessary). I suggest you find one of the $10 or $20 utilities for resizing tools (higher compression, smaller dimensions, watermarks, removing EXIF) to fill in this part of your workflow. What we all need from PhotoLab are the full size jpegs (for print, for masters for resizing for web) and the TIFFS for re-editing in a pixel editor for advanced masking and combining of multiple pictures (HDR for instance). Just a suggestion. If you are on a Mac, I can make some recommendations. TillTheEndofEternity made a suggestion for Windows which is free.